Flaunt your fandom with these Batman Cufflinks! Class up that tux with the help of the Caped Crusader! Batman's first issue comic book cover will look great with your suit. Bruce Wayne would wear these. So should you! Class up that tuxedo with the help of the Caped Crusader and these Bat-tastic Batman First Issue Comic Book Cover Cufflinks. Bruce Wayne would wear these, and if they're good enough for a suave billionaire, they're good enough for you! Besides, that cool first-issue Batman comic book cover will look great with your suit. 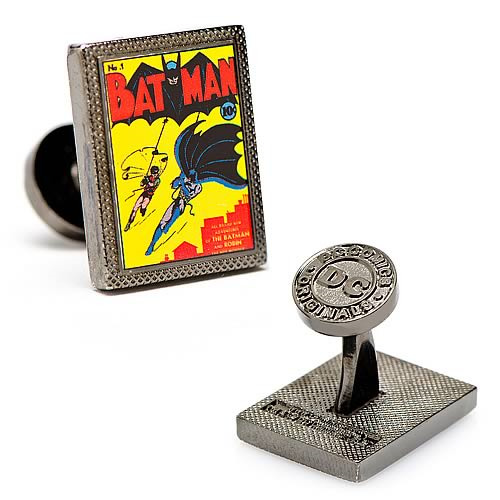 You can really flaunt your fandom when you wear the Batman First Issue Comic Book Cover Cufflinks! This cufflink measures about 3/4-inches tall.